Another part of the Including the Excluded project is to catalogue the records of The Children’s Society’s homes that looked after disabled children. The first of these homes was St Nicholas’ Home in Tooting, Surrey, which opened in 1887 specifically to care for disabled children. Shortly afterwards, other homes specialising in the care of disabled children were opened, including St Agnes’ in Croydon (opened in 1897), St Martin’s in Surbiton (opened in 1898), Bradstock Lockett in Southport (opened in 1901), and others. When these homes first opened, they specialised in teaching the children trades that would help them to earn their own living once they were old enough. Many of the children living in these homes had mobility difficulties and so they were taught trades that could be done while sitting down, such as tailoring, basket weaving and machine knitting. 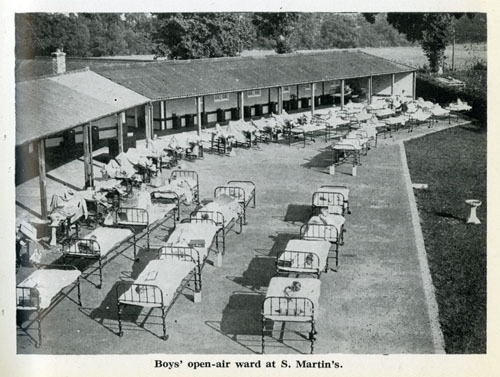 As time went on, homes such as St Nicholas’ and St Martin’s in Pyrford and Halliwick School in Winchmore Hill began to focus on developing and providing medical treatments for the children in their care – particularly for orthopaedic conditions and Tuberculosis – through open air treatment, artificial light therapy and physiotherapy, including swimming therapy. 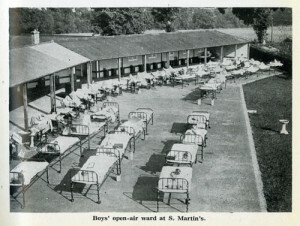 The above photograph shows the open-air ward in St Martin’s, Pyrford. Another set of homes, including St Monica’s in Kingsdown and Corfield House in Rustington, were set up to look after children with diabetes. They were set up in the late 1940s in an innovative partnership with the Ministry of Health. These homes would teach the children how to administer their own insulin and regulate their diet. The records that survive from the disabled children’s homes vary greatly from home to home, but they can include minutes, annual reports, plans of the home, registers of children admitted, publicity material, and more. These records provide an insight into the ways the homes were run and what it would have been like to live or work there. By the 1970s, most of the children’s homes had closed down as part of The Children’s Society’s move away from residential care to other, more innovative ways of helping children and young people. This entry was posted in Including the Excluded and tagged Children's homes by Janine Stanford. Bookmark the permalink.